Named Belize Hotel of the Year in 2009 by the Belize Tourism Board, Hamanasi is an ideal Belize resort located on a beachside private nature reserve, offering casual elegance & fine dining in a stunning natural setting with easy access to the best adventures Belize has to offer both on and offshore. Friendly, attentive staff will greet you with warm smiles and exceptional service and knowledgeable, professional guides will scuba diving, snorkeling, hiking, caving and Mayan ruins. 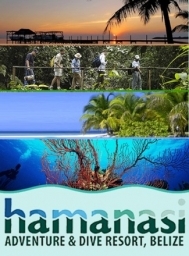 When planning your trip, Hamanasi's blog showcases real Belize vacation stories.